Madison Avenue – for many, it is the very definition of prestige. 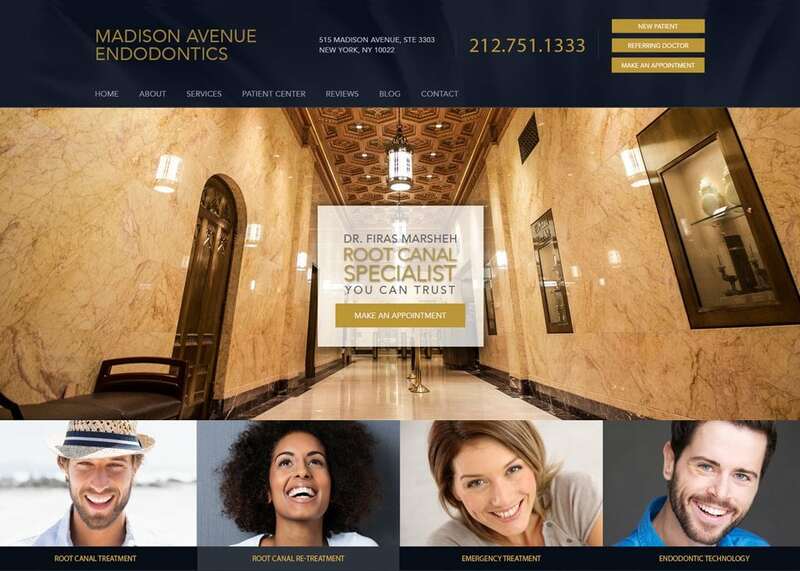 As an endodontic practice in the heart of this affluent area, Madison Avenue Endodontics is looking to be the premier root canal specialist in New York. For this custom endodontic website, we knew the practice should appeal to discriminating tastes, which is why we carefully constructed a strikingly beautiful website that exudes luxury and opulence. We opted for a traditional header and menu bar, followed by a large, expansive welcoming image and another prominent, image-based menu that spotlights four special areas – root canal treatment, root canal re-treatment, emergency services, and endodontic technology. Next, visitors are welcomed to the site and introduced to Dr. Marsheh before reading reviews and potentially scheduling a consultation. Nothing speaks of stately elegance quite like the color gold. We chose to compliment the gold tones throughout the website with deep shades of navy blue. Together, they give the impression that this is a long-established practice with a reputation for quality and excellence. We are particularly proud of this custom endodontic web design, as it meets the needs of the practice, potential patients, and referring physicians. From the header, site visitors can choose to explore the website as either a new patient or a referring physician. For the sake of simplicity, we integrated patient forms directly into the website, which helps to minimize in-office paperwork during a patient’s first visit. Instead of a long, form-like appointment submission section, we created a unique, horizontal section that allows for complimentary consultation requests. We also included several patient reviews that compliment the cleanliness, organization and professionalism of the practice. Perhaps one of the most effective marketing elements within the site, however, is the use of video. Smiling, satisfied patients offer praise for the practice and give credence to the practice. Other online endodontic marketing techniques can be also found throughout the site, including links to the practice social media accounts and the logos of professional organizations the practice is affiliated with. Given the combination of luxe imagery and beautiful, rich colors, there is no question that patients are pampered and served with highly attentive care. We opted for a large image of the hallway leading to the practice – one clad in gold, bronze, and ornate architecture. The pictures that adorn the site are carefully selected to uphold the image of the practice while still minimizing any anxiety visitors may be experiencing about upcoming dental work.